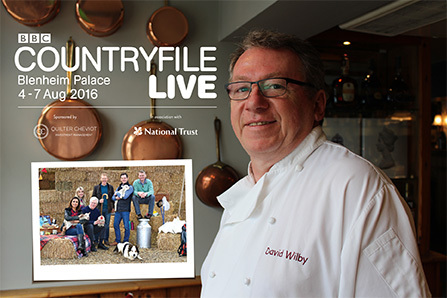 We’re delighted to announce that David Wilby, our chef patron, hosted the public and VIP restaurants at the BBC’s prestigious Countryfile Live event, held at Blenheim Palace on 4-7 August. The main restaurant, called Rotisserie and Rose, served an a la carte menu using produce sourced from farms from across the UK. This follows David’s recent appearance at the British Food Festival at Windsor Racecourse, where he held a food demo alongside Will Torrent and other high-profile chefs from the area. The event was designed to enable people to enjoy the best of the British countryside within the spectacular grounds of Oxfordshire’s Blenheim Palace over the four days.